I like industrial music -- the harsh beats, the thundering noise, the screaming. I've reviewed Nine Inch Nails and Skinny Puppy a few times here, and talked about my love of Cabaret Voltaire. I mention this because Post Plague is an industrial album. 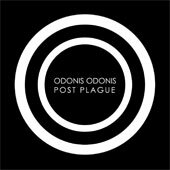 From what i read online, Toronto trio Odonis Odonis were not always an Industrial band. Pitchfork calls them "surf/garage" which is their term for "annoying hipster rock". Instead, Odonis Odonis have a series of synths (or, maybe, a bunch of MacBooks), some percussion, a bass, and a few guitars. Most of the music here sounds programmed, like instead of drumming they have a drum machine. There are spots where an actual guitar shows though, but most of the music here sounds like it was made with computers. That's okay: Industrial has always been a very computer-mediated style. Computer mangling suits the darkness of Industrial music: take old sounds (the agrarian past) and feed them through a computer (modern industrial society) and output energetic, angry, frantic noise (the existential state of disillusionment with modern society). I enjoy the heck out of that kind of thing, but i know that lots of people do not. Among the 20 or so people in my core friends group, the only ones who really like this kind of thing are me and Carlos. Everyone else looks kind of confused when i play this kind of music on the stereo. And i get that. This is dance music for dancing in the void, for dancing as the world seems to rush past you at speeds you cannot imagine anymore (how the heck is it October already????) and with images and sounds that make no sense. The world makes no sense. Nothing makes sense, so just scream about it. That is what Industrial music does, and it is what Odonis Odonis do on Post Plague. Now, theoretically, this is a concept album about life after a world-ending plague of some kind kills most people. It embraces and revels in the sense of loss and emptiness that a mass die-back of humans would necessarily generate. (And do you ever think about how bad everything must smell in those kinds of apocalyptic wastelands? All those bodies, dead of the plague and rotting... Ewww....) That said, it's kind of hard to understand a lot of the words on the record. The vocals are screamed and yelled as often as they are sung. So it's not like they try and beat you over the head with this concept: it's not an opera, just a set of loosely thematically connected tunes. Feel free to ignore the theme if that works for you. The record starts with Fearless, a throbbing, pulsing mess of a tune that ebbs and contracts, the vocals distorted and the beats precise, fast, and angry. They start Needs with screaming, just that Industrial howl of angst. Then a really deep beat comes in, a just a loud thumping, followed by a very old shrill vocal sample, the kind that sounds like a mass of angry people harmonizing. This is rage with a dance beat, the whole thing swinging angrily around. Awesome. That's How It Goes has a whining keyboard trill and ponderous pace that reminds me of Earth Sun Moon-era Love & Rockets, but on Nervous they add in a synth bass! I love synth bass, that slippery deep warbling sound that is like nothing else. They combine that bass with machine gun beats and screaming. The song just taps along catchily, like something off of the first She Wants Revenge first record. It builds to godawful loud level with the voice screaming into the void. I really like the way this songs grows: that machine gun percussion, the screaming, and the happy little melody played on warbling synth bass. BLTZ is all percussive noise and faint keyboard drones. They add in Kathryn Calder of New Pornographers for additional vocals on Pencils. This is a slower tune with a lovely bass line. This is minimal and catchy, the bassist seeming to channel David J. On Game the guitar is a post punk warble, the drums flat and steady, and the voice disaffected and so very European sounding. Then synths wash in as a lovely wave with a really great melody, like a lost dance hit from the mid 1980s. It is, simply, an awesome tune. Vanta Black is more like She Wants Revenge, The voice is a little more upfront and the beat is a crunchy dance floor thing that just rocks along, while the guitar is an angry warble. Really nicely done. Betrayal features a loud fast beat that seems to overpower everything. It is a harsh, clanging song. And finally the record ends with Lust, a slow and eerie tune dominated by bass, the drum beat a flat tapping. The vocalist sings "i just want some kind of lust / to knock me off of my feet", bored and hopeful all at once, which is, after all, very industrial. I really enjoy this record. I suppose it is very different from the "surf/garage rock" that Odonis Odonis used to do, but that kind of scrap is boring anyway. This is cool.